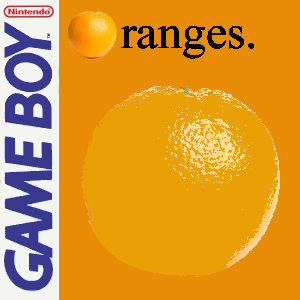 oranges for the game boy. 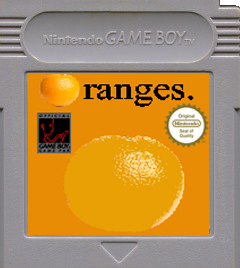 here's a game I'm making called "oranges." It is quite lovely. Bob is stuck in the orange packaging plant where the packing machine has gone out of control and is spitting out oranges all over the place! Why? Some idiot poured radioactive goop all over it and so the oranges turned radioactive! So, locked into the room, Bob needs to dodge the oranges the Orange-O-Matic spits out or else he's toast, which would go good with oranges for a nutritious breakfast. Most items are useful. They help Bob survive. Some can be annoying, though. Here's the items that are in the game so far. FORK - Bob flashes when he gets the fork. Anytime Bob flashes, he can eat the oranges instead of avoiding them. This power only lasts for a few seconds, though, so be careful when it's about over. BANANA - What's a banana doing in a game about oranges? Giving you 15 points every time Bob gets one, that's what. SYRUP - Slow down the oranges with this one. ROM and source code. Last updated: january 21, 2018 @ 11:15am. oranges. copyright 2017-8, chris read.